Harlow MP Robert Halfon has written to Princess Alexandra Hospital today, urging it to “reconsider” contracting out its cleaning services. The MP’s intervention came after UNISON representatives met him last week to explain their concerns over plans to privatise domestic services at the hospital. 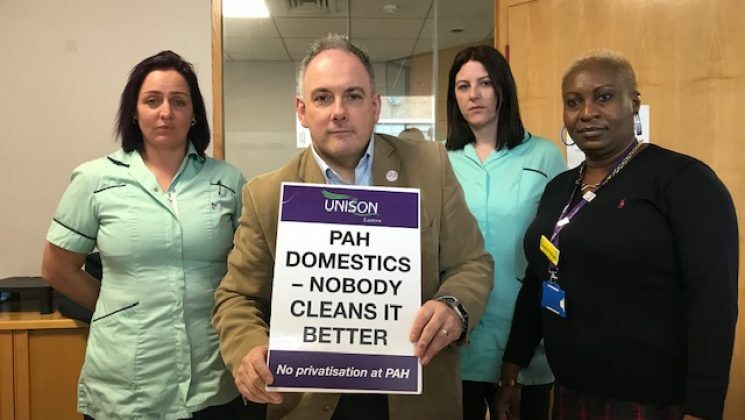 Cleaners from the hospital warned that outsourcing would create a two-tier workforce at PAH, as new employees would likely be on worse pay and conditions than the staff transferred over from the NHS. They also raised concerns about job security and worsening services if their jobs are privatised and recalled the brief privatisation of services in the 1990s, when Mediguard had to hand back the contract after just one year because of its failure. 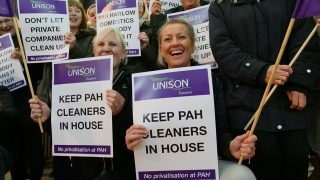 PAH is currently ‘market testing’ the domestic services at the hospital, the first step in privatising the service. Conservative MP Mr Halfon wrote to PAH chief executive Lance McCarthy today to express his opposition to the plans. “It is a testament to the hard work of the NHS staff at the Princess Alexandra Hospital at every level that they have brought the hospital out of special measures last year,” he said in the letter. 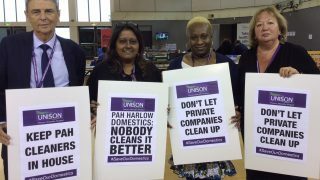 UNISON regional organiser Caroline Hennessy said: “It’s great to have support from Harlow’s MP in our fight to protect jobs and services at PAH. “Robert Halfon is speaking for the vast majority of people in Harlow, and the UK as a whole, when he raises these concerns about outsourcing our hospital services. “Private companies come in to clean up for shareholders, not patients. They’ll cut corners to raise more cash, putting patients and the public at risk. Read Robert Halfon’s letter to PAH. Photo above shows Robert Halfon MP with (l-r) PAH domestics Lyndsey Johnstone and Rachel Dowsett and UNISON PAH branch chair Daniella Pritchard.